When analysing sports betting markets, bettors think about three people; themselves, “sharps” and “squares”. They will also often bet on games in one of two ways. Either get a hunch on a team through intuition or handicapping and then seek validation on their position by searching for information about sharp and square action or seek sharp and square action information first and use the findings to guide their handicapping or create their intuition. I have a few issues with this methodology. The first is that categorising the entire betting market into two types of people is wildly inaccurate. I cringe every time I see posts online that read, “sharp bettors cleaned up this week” or “squares get crushed this weekend”. The second is that nobody officially earns sharp or square status. The definition is so broad and misleading, matching action to the source with so many anonymous participants in a market is an impossible task. The third is that every bettor handicaps a different way. What may encourage one bettor to push confirm on a bet could encourage another bettor to turn away and delete the game from their bet slip. Instead of handicapping sharps and squares, I encourage everyone to begin “handicapping into buckets”. What is handicapping into buckets? In my handicapping process, after I make a case for both sides (as outlined in part one of The Simple Handicap method). I dig into markets from different viewpoints. I seek to understand how other bettors in the market view the matchup. Sports betting is bettor vs. bettor, not bettor vs bookmaker. If I know what other bettors see, I can put value in line movements and get a clear picture of who moved a market, and why. Statistical handicapping is based on the numbers. My goal with looking at statistical handicapping is not to try to decipher complex models, but rather spot deficiencies that numbers create in betting markets. Bettors who rely on statistics tend to trust the numbers blindly – often rightfully so. Statistical bettors tend to move the markets very quickly, early in the market lifespan. Analytical handicapping is based on the on-field matchups. My goal with looking at analytical handicapping is not to make player projections, but rather identify significant matchup advantages and then estimate whether or not the matchup is priced into the market or not. Analytical bettors tend to move the markets slowly throughout the market lifespan as their information is much more difficult to put a price on for others in the market. Situational handicapping is based on the team vs. team matchup. My goal is to highlight any travel, weather, rolling schedule (back to back, short rest) and potential play up or play down spots. I try to be very careful with situational identifiers because these factors are very subjective and affect all teams differently. Situational bettors tend to move markets past extremes early and late in the market lifespan. Informational handicapping is based on player news and injuries. There are two layers to this bucket, estimation and reaction. We know any player changes or injuries have a direct effect on the betting market, but taking advantage of this is more complex than people might think. The first step is estimating what a players’ value to the price is. The second step is judging if the market over or underreacted to the news in relation to the value you have attributed it. Informational bettors tend to move markets sporadically during a lifespan, but the lingering effect can tail out long after the initial price move. Recreational handicapping is based on the public narrative. This is the most natural type of handicapping because it is passive and only requires listening or reading. I often buy mass published newspapers and magazines or watch widely syndicated sports shows to get the lowest common opinion on a game. Often bettors can limit their information and become too specific. I think it is essential to keep a broad view. Recreational bettors have minimal impact independently on the market, but if a narrative is strong enough, the masses can move a price throughout the market lifespan, typically near to the end. Implementing this type of handicapping can be difficult. It requires work and effort, but the benefits compound. Looking at just sharp or square action has a short shelf life. There is very little that can be taken away long term and it does nothing to improve a bettor’s thought process. Handicapping into buckets, however, allows for knowledge to accumulate over time. At first, this process will take a long time, but it will quickly become routine and require little thought. Aside from the knowledge accumulation aspect of handicapping into buckets, the upside lies in understanding who is moving a market and being able to evaluate it. All of the five buckets can have bettors within them who are considered sharp or square but knowing what mindset moved a market can allow for better decision making. Let’s say the point spread moves from New England -14.5 to -13.5 mid-market lifespan. A move from +14.5 to +13.5 on an Arizona Cardinals team with just two wins on the road at New England, the best team in league with 10 wins would be classified as a “sharp” move by 99 out of 100 bettors. However, with a little bit of effort, it would likely be determined the movement is in fact informational. At first, this process will take a long time, but it will quickly become routine and require little thought. If this was the case and I was breaking down the market, I could handicap the game into each bucket to confirm. Rather than assuming all bets on Arizona are sharp, and all bets on New England are square and eliminate one side from my mindset, I can now understand why a specific type of bettor moved the market and determine if my own personal views warrant a position or a pass. 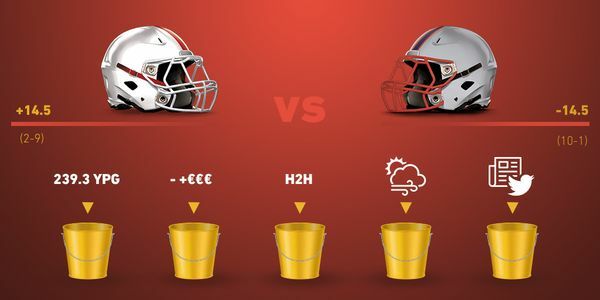 Handicapping into buckets is an easy way to understand markets better and make more informed betting decisions.